I love serendipitous moments. While I was reading a book and falling a love with it, the character in my book described reading a book and falling in love with it. And it was during Ramzan (or Ramadan as it is known in the Arab world.) Why is that last part relevant? Read the beautiful passage below. 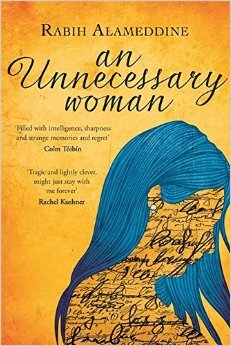 The book is Rabih Alameddine’s An Unnecessary Woman, a portrait of a 72 year old woman living alone in Beirut. Ah… the deliciousness of discovering a masterwork. the beauty of the first sentences, the “what is this?,” the “how can this be?,” the first crush all over again, the smile of the soul. My heart begins to lift. I can see myself sitting all day in my chair, immersed in lives, plots, and sentences, intoxicated by words and chimeras, paralyzed by satisfaction and contentment, reading until the deepening twilight, until I can no longer make out the words, until my mind begins to wander, until my aching muscles are no longer able to keep the book aloft. Joy is the anticipation of joy. Reading a fine book for the first time is as sumptuous as the first sip of orange juice that breaks the fast in Ramadan. I’m halfway through my love affair with this book. The full review will be up soon!